After a Thursday qualifying session at the Indianapolis Motor Speedway, Paul Tracy and the #15 Geico car appeared a lock for the 2010 Indy 500. A single lap run resulted with a strong 226.322 mile per hour average speed for Tracy allowed him and his KV Racing Technology team to feel positive about the two-days of qualifying. On Pole Day, confidence went out the window as they fell short of make the top 24 cars leaving the team hopes teetering the final Sunday qualifying known as Bump Day. Earlier in the Bump Day qualifying session, Paul Tracy and the #15 KV Racing Technology team entered a four-lap run at 223.892 miles per hour. Electing to better their time, a decision was made to withdraw the time in order to let Tracy achieve a better run. Attempting the run just 6 minutes to the end of the qualifying session, the #15 Geico-sponsored car could not even find the speed to equal their prior qualifying performance. 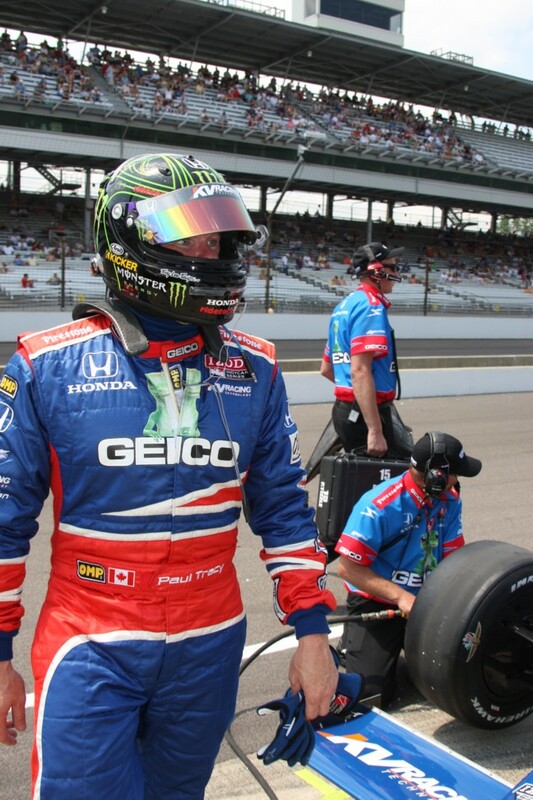 As time ran out on Sunday, Tracy was left without one of 33 spots for this year's Indy 500. Sadly, the previous four-lap run which had been abandoned by the #15 KV Racing Technology team would have been enough to beat the #29 car of Sebastian Saavedra for the 33rd starting position. "The decision to withdraw our time and re-qualify was a team decision. We win as a team and lose as a team. I just feel bad for the whole team." a disappointed Paul Tracy commented adding "It wasn’t for a lack of trying". Paul Tracy admitted that the car just didn't have the handling in the warmer weather of Bump Day. The normally intense open wheel driver was very composed despite what was obviously a lost opportunity to run the biggest race of the year in the IZOD IndyCar Series. However, on Paul Tracy's Twitter feed a true sense of frustration can not be hidden. One posting read " I can't tell you how crappy I feel , I gave it everything I had , I guess it was better that being at home watching". No reminder is needed to explain how difficult the Indianapolis Motor Speedway has been on Paul Tracy. In many people's eyes, the Canadian driver won the 2002 Indy 500 but had the true victory taken away under arguable circumstances where Helio Castroneves was declared in front of Tracy during the final laps. Having qualified 29th that year, Tracy had been reminded of his effort of 2002 after Saturday's qualifying. Barring any developments through the upcoming week where Tracy could gain a substitute driver role in the Indy 500, the Canadian flag will flown by Alex Tagliani in the FAZZT Race Team's #77 car. However, even a back-up driver spot seems unlikely since Paul Tracy has been reported heading to Toronto shortly after the Bump Day fiasco. As for Paul Tracy, it's safe to assume that this will not be the last time we'll see the West Hill, Ontario native racing an Indy car for 2010. With the two Canadian rounds of the IZOD IndyCar arriving in less than two months, the races are concern to be heightened by some announcement involving Paul Tracy participation.